This is the Spain Football Accessories and Merchandise store. At Soccer Box you can shop for the official home and away football shirts. We also stock a selection of Spain football souvenirs that are perfect for every day use and novelty gifts for supporting the Spain national team. Football merchandise is a fantastic way of showing your team allegiance every day. We stock a variety of Spain football accessories including scarves and flags. The Spain football merchandise range is designed in the famous red and yellow color scheme that has been used since the team 1st played in 1920. Shop for your Spain Football Accessories and Merchandise and Cheer on the World’s Number 1 Team! 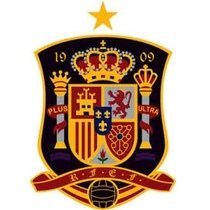 Since the turn of the century the Spain football team has been one of the most watched and talked about national squads. Spain has dominated the football stage both in European and World tournaments. They have become the 1st team to win 3 consecutive major international trophies. This success has caused a huge surge in sales of the Spain football kits, and Spain football merchandise. Spain had their 1st major win in 2008 when the lifted the UEFA European Champions trophy. They followed this success in 2010 by becoming only the 8th team to win the FIFA World Cup. In 2012 they retained UEFA European Champions trophy by winning 4-0 in the final. The Spain football squad has a host of well-known star players that are popular with fans. You can cheer on your favorite player or the whole team with Spain football accessories and merchandise. The current Spain squad has been compared to other famous winning teams, including the 1970 Brazil team that included the infamous Pele and won the World Cup. Whichever team you support you can always shop for football accessories and merchandise at Soccer Box! Why not compliment your Spain football accessories with one of the brand new Spain football shirts. All of our shirts are official and manufactured by Adidas. Shop Now for Spain Football Accessories and Merchandise and Cheer One of The Best Teams to Of Ever Graced a Football Stadium!